Having a beautiful and functional kitchen at home is everyone’s dream since the kitchen is the place where our day begins, where we meet to prepare and share delicious meals, where we receive guests when we want to share with them and taste a nice special dish. The kitchen is the most important place in our home; in addition to liking what we cook, we are happy in it. Do you want to remodel your kitchen to make it more functional and cozy? At Dream Home Builders and Remodelers we can help you with these services. We specialize in building homes in Charlotte. Open a window: an entrance of natural light is important, so, if you do not have a window, or you have a very small one, then you can make a wide one, that will let in a lot of light and give a sense of spaciousness to your kitchen. We offer custom made builders to make your project come alive. Paint the walls or the tiles: sometimes the appliances and the countertops are fine but the tiles might be outdated. To take them from traditional to modern you can paint them with special paints that will give them a new look. You can also paint the walls so they can be more in tune with the implements of the kitchen and change the aspect of this space. Change some things: you can put new ornaments without having to make a big renovation, for example: if you have fruit figures you can change them for a set of cutleries, place the figure of a Chef, you can change the lamps for more contemporary ones; small but significant details. With the help of an interior designer it is easy to do this. Cabinets must be functional: the storage in a kitchen is a priority, so if your cabinets do not correspond to your needs you must change them and take care that each drawer and space is adequate for what you are going to store in it, taking into account the interior and the finishes of them. They should be durable and easy to clean. Space is important: do you have a small kitchen and want to gain space? You can remove a wall and move your kitchen backwards with the help of a design, a contractor and builders, or you could attach an island to the front to make more space and move more freely. Durability and sustainability: if you are going to change the countertop or the appliances, we suggest stainless steel, which is easy to clean and durable. We also recommend a faucet with water flow control to save water and energy saving lamps. Wall covering: if you want to give another view to your kitchen without changing the implements and countertop, you can simply coat the walls with cement, bricks, ceramics, and tiles with the help of us, specialists in house building. Add a table for breakfast: if on the contrary your kitchen is wide and everything is in perfect order but you want to renew it, you can integrate a table and chairs in a color that is in harmony with everything else, this will make your kitchen cozier. 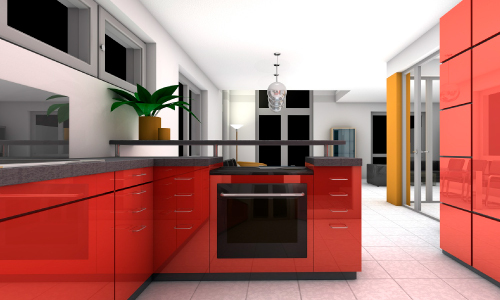 The kitchen is the most important area of ​​the house, remodeling it adds value to it and keeps it on trend. On the other hand, remodeling or renovating the kitchen, does not have to become a large outlay of money, it is about redesigning some very specific parts with style and following the right advice.